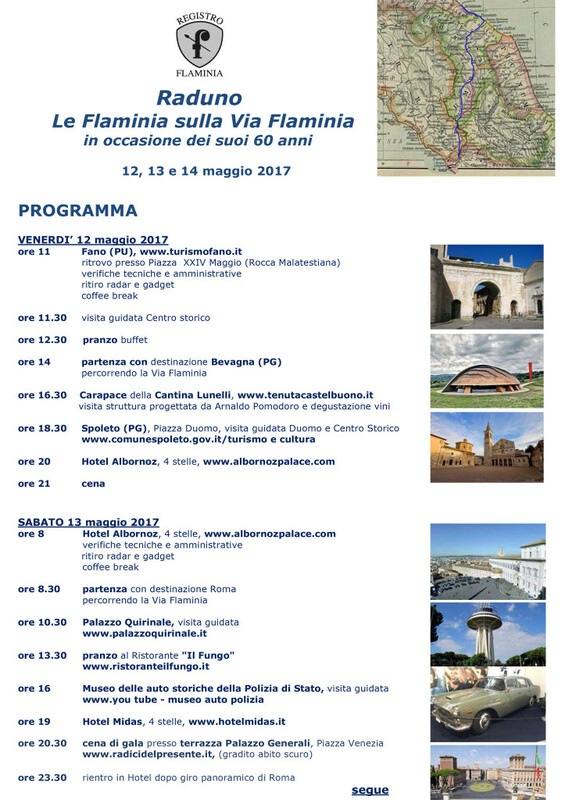 Startseite » 2017 » Invitation to the Meeting „Le Flaminia on the Via Flaminia“. Invitation to the Meeting „Le Flaminia on the Via Flaminia“. in order to celebrate the 60th anniversary of the Lancia Flaminia’s first market sales, which started from 1957, the Registro Flaminia, www.registroflaminia.com, will organize, from 12th to 14th May 2017, the „The Flaminia on Via Flaminia“, historical cars gathering. Only Lancia Flaminia cars, in their different versions, will be admitted at the meeting, with the limit of 30 crews. Starting from Fano, the attendees will drive, mainly through the Via Flaminia Consular road, to Rome, where they will have an evening gala dinner in one of the most beautiful and scenic terraces in town. During the journey, the drivers, accompanied by professional tour guides, will visit the Fano city centre, the Spoleto’s Cathedral and the „Palazzo del Quirinale“ and the Museum of State Police Cars in Rome. 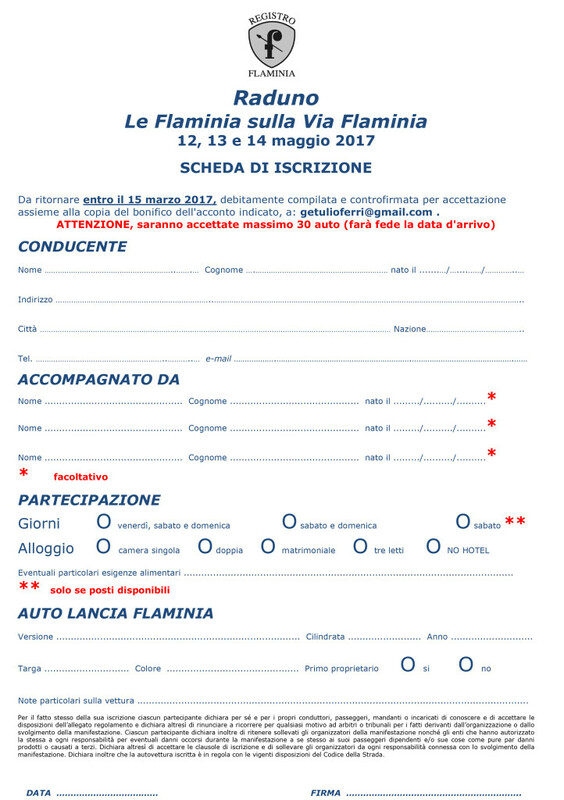 No scheduled time or speed trials are foreseen during the event, but all the crews will deal with a gag skills test to compete for „Trofeo Registro Flaminia 2017“. Some nice tributes will be given to all crews and special awards will be assigned to women crews, foreign crews, Italian crews coming from farther away, to the oldest cars and so on. Please, see the program and the card registration attached. LONG LIFE TO LANCIA! LONG LIFE TO FLAMINIA! Per celebrare i 60 anni dall’inizio della commercializzazione della Lancia Flaminia, avvenuta nel 1957, il Registro Flaminia, www.registroflaminia.com, organizza „Le Flaminia sulla Via Flaminia“, un raduno che si svolgerà il 12, 13 e 14 maggio prossimi. 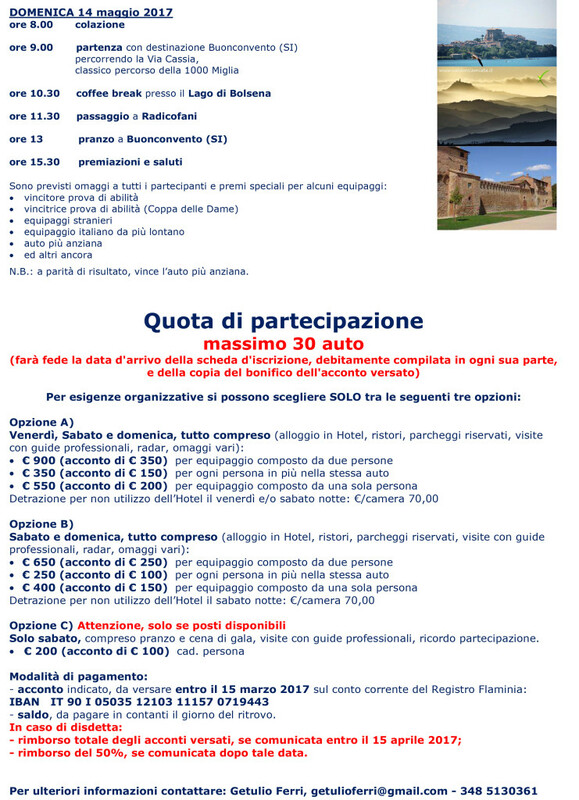 All’incontro possono partecipare SOLO le Lancia Flaminia nelle loro varie versioni e massimo 30 equipaggi. – il Museo delle Auto della Polizia di Stato. Durante l’evento non sono previste prove di regolarità ma solo uno scherzoso test di … abilità che sarà valido per aggiudicare il Trofeo Lancia Flaminia 2017.